Mercury’s rocky surface has yielded evidence that two distinct rock types may have originated from massive lava flows across the planet’s surface. By analysing the chemical composition of rock features on Mercury, scientists at MIT have shown that about 4.5 billion years ago it may have harbored a massive magma ocean. Scientists analysed data obtained by MESSENGER (MErcury Surface, Space ENvironment, GEochemistry, and Ranging), a NASA probe that has been orbiting Mercury since March 2011. In September 2011, another group of scientists analysed X-ray fluorescence data from the probe; it was this data that showed two distinct rock compositions on the planet’s surface. The rocks on Mercury’s surface reflect an intense fluorescent spectrum; Mercury takes the brunt of the Sun’s rays. Scientists can measure the surface rocks’ fluorescent spectrum with X-ray spectrometers in order to find out the chemical composition of the surface materials. MESSENGER’s onboard X-ray spectrometer measured the X-ray radiation generated by Mercury’s surface as the craft orbited the planet. The MESSENGER science team was able to parse these energy spectra into peaks: each of these peaks represents a different chemical element within the rocks. This was how the group identified two main rock types on Mercury’s surface, which most resemble terrestrial volcanic rocks known as basaltic komatiites. To discover what geological processes formed these distinctly different surface compositions, the team from MIT translated the chemical element ratios into the corresponding building blocks that make up rocks (eg magnesium oxide, silicon dioxide and aluminum oxide). They then recreated the rock types in the lab, using the compositional data. These synthetic rocks were melted in a furnace at a variety of temperatures to simulate different geologic processes. Once the samples were cooled, the researchers picked out tiny crystals and melt pockets for analysis. Initially the scientists looked for scenarios where both rock types could be related however the two compositions were found to be so different that they could not have come from the same region. Only one phenomenon seemed to explain the two compositions: an ocean of magma that over time formed different compositions of crystals as it solidified. These crystals then remelted into magma that then erupted onto Mercury’s surface. This magma ocean likely existed within the first 1 million to 10 million years of Mercury’s existence, more than 4 billion years ago. 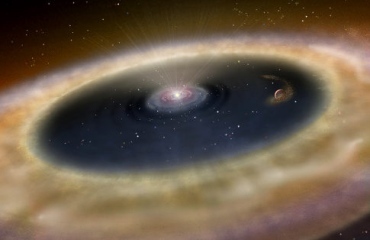 The processes of collision and accreting early in the formation of our solar system may have produced enough energy to completely melt the planet, which would make an early magma ocean very feasible. This image of Mercury was produced by using images from the colour base map imaging campaign during MESSENGER’s primary mission. The colours do not display what Mercury would look like to the human eye, but they enhance the chemical, mineralogical, and physical differences between the rocks that make up Mercury’s surface. Mercury speeds around the sun every 88 days, traveling through space at nearly 50 km (31 miles) per second — faster than any other planet. 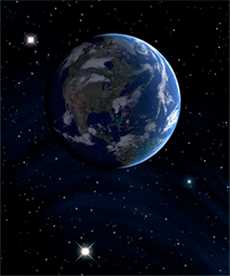 One Mercury solar day equals 175.97 Earth days. Mercury’s elliptical orbit takes the small planet as close as 47 million km (29 million miles) and as far as 70 million km (43 million miles) from the sun. If one could stand on the scorching surface of Mercury when it is at its closest point to the sun, our star would appear more than three times as large as it does when viewed from Earth. 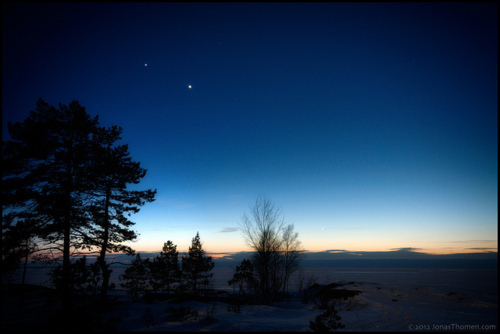 Because Mercury is so close to the sun, it is hard to directly observe from Earth except during twilight. Mercury makes an appearance indirectly, however — 13 times each century, Earth observers can watch Mercury pass across the face of the sun, an event called a transit. The transits fall within several days of May 8 and November 10. The first two transits of Mercury in the 21st century occurred 7 May 2003 and 8 November 2006. The next will occur on 9 May 2016. Temperatures on Mercury’s surface can reach 800 degrees Fahrenheit (427 degrees Celsius). Because Mercury’s atmosphere is so thin, the surface cannot retain that heat so nighttime temperatures can drop to -290 degrees Fahrenheit (-179 degrees Celsius). Mercury’s thin atmosphere, or exosphere, is made up of atoms blasted off the surface by the solar wind and micrometeoroid impacts. Because of solar radiation pressure, the atoms quickly escape into space and form a tail of neutral particles. Though Mercury’s magnetic field has just 1 percent the strength of Earth’s, the field is very active. The magnetic field in the solar wind episodically connects to Mercury’s field, creating intense magnetic tornadoes that funnel the fast, hot solar wind plasma down to the surface. When these ions strike the surface, they knock off neutral atoms and send them on a loop high into the sky where other processes may fling them back to the surface or accelerate them away from Mercury. Mercury’s surface resembles that of Earth’s Moon, scarred by many impact craters resulting from collisions with meteoroids and comets. While there are areas of smooth terrain, there are also lobe-shaped scarps or cliffs, some hundreds of miles long and soaring up to a mile high, formed by contraction of the crust. The Caloris Basin, one of the largest features on Mercury, is about 1,550 km (960 miles) in diameter. It was the result of an asteroid impact on the planet’s surface early in the solar system’s history. Over the next several billion years, Mercury shrank in radius about 1 to 2 km (0.6 to 1.2 miles) as the planet cooled after its formation. The outer crust contracted and grew strong enough to prevent magma from reaching the surface, ending the period of volcanic activity. 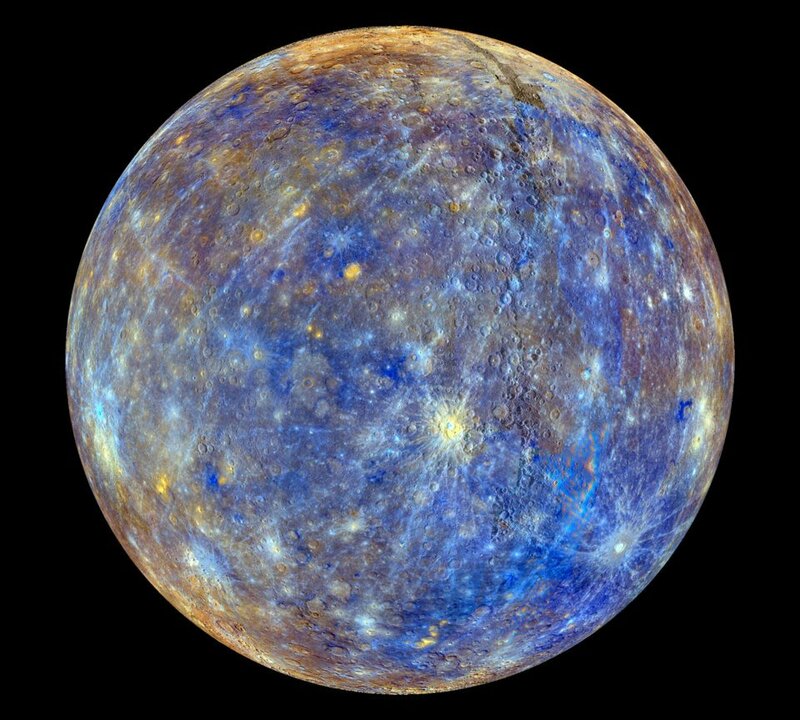 Mercury is the second densest planet after Earth, with a large metallic core having a radius of 1,800 to 1,900 km (1,100 to 1,200 miles), about 75 percent of the planet’s radius. In 2007, researchers using ground-based radars to study the core found evidence that it is molten (liquid). Mercury’s outer shell, comparable to Earth’s outer shell (called the mantle), is only 500 to 600 km (300 to 400 miles) thick. The first spacecraft to visit Mercury was Mariner 10, which imaged about 45 percent of the surface. In 1991, astronomers on Earth using radar observations showed that Mercury may have water ice at its north and south poles inside deep craters that are perpetually cold. Infalling comets or meteorites might have brought ice to these regions of Mercury, or water vapor might have outgassed from the interior and frozen out at the poles. In 2008 and 2009, NASA’s MESSENGER mission performed two close flybys of Mercury. By the second flyby, the spacecraft had imaged about 80 percent of the surface at useful resolution and made discoveries about the magnetic field and how Mercury’s crust was formed. The flybys employed Mercury’s gravity to help ease the spacecraft into orbit in March 2011. The spacecraft is studying and imaging Mercury from orbit and will map nearly the entire planet in color. MESSENGER is the first spacecraft to orbit Mercury. Mercury is appropriately named for the swiftest of the ancient Roman gods. Mercury, the god of commerce, is the Roman counterpart to the ancient Greek god Hermes, the messenger of the gods. 1631: Pierre Gassendi uses a telescope to watch from Earth as Mercury crosses the face of the sun. 1965: Though it was thought for centuries that the same side of Mercury always faces the sun, astronomers find the planet rotates three times for every two orbits. 1974-1975: Mariner 10 photographs roughly half of Mercury’s surface in three flybys. 1991: Scientists using Earth-based radar find signs of ice locked in permanently shadowed areas of craters in Mercury’s polar regions. 2008: MESSENGER’s first flyby of Mercury initiates the most comprehensive study yet of the innermost planet. The three flybys revealed the side of the planet not seen by Mariner 10. Also, many more images and discoveries were obtained by these flybys. It happens three times a year, Mercury goes retrograde and changes all our plans. The Thinking Planet, Mercury the messenger goes retrograde (out of phase) three to four times a year for around 3 weeks each time. Mercury’s movement appears to go backwards, this is called Mercury retrograde and it can cause all sorts of mayhem! Mercury, known as the planet of intellect can affect the way you think, communicate and relate. It’s known as the celestial messenger of the gods. It has a strong affect on all forms of travel and communication as well as technical correspondence and equipment. It starts at 6 degrees Aries, from March 12 to April 5. We still have Mars Retrograde and Mars doesn’t go direct until the April 15. So we get a double retrograde. Mercury will zig-zag through the high-flying stars of Pegasus, including the infamous fixed star Scheat, then reverse over the tail of Cetus the sea-monster. This is quite a daring mission for Mercury then. Mercury retrograde and Scheat both have travel chaos in common. Obviously the world cannot grind to a halt during this time, but it will be interesting to see if we get more than our fair share of crashes during the time they are conjunct. Mercury on Scheat brings accidents and trouble through writings. Mercury is the planet that most people seem concerned with when thinking of retrogrades, perhaps it is the one they most notice the effects of. Mercury does rule communications, communication devices such as telephones and computers, transportation and our daily routine so a retrograde phase can cause havoc in our otherwise orderly worlds. The affect of a Mercury retrograde can cause these things to malfunction or for instructions to be misinterpreted and this makes things go awry and for people to change their minds, cancel appointments and forget to turn up when they should. Those with some knowledge of astrology know that the affects of a Mercury retrograde occur a little before and after the dates given. The reason for this is that Mercury will retrograde and travel back to a certain degree before it stations again and goes forward. It then has to make up ground until it reaches the original degree before it went retrograde. Mercury comes from the Latin word merx, or mercator, which means merchant. Mercury is the name given by the ancient Romans to the Greek mythological god Hermes. Mercury is depicted as a male figure having winged sandals and a winged hat, indicating the ability to travel quickly. He was the official messenger of the ancient gods and goddesses and, as such, governed communications. In 1782, Mercury became the first symbol of the United States’ postal service. Today, he is the Icon of an International floral delivery service. In astrology, Mercury influences travel, literature, poetry, merchants, and thieves. He is cunning and witty at a moment’s notice. But he is also recognized as a trickster and prone to misbehavior. In Aries: Expect to be frustrated and frazzled. Assertive, impulsive Aries wants to move ahead, and all of the energy is going backwards. Watch what you say and how you say it. Pay attention to what people say to you; you might be pleasantly surprised. In Taurus: Take time to formulate your thoughts. Taurus, an unhurried sign, slows down the mental processes. He also governs banking, so delay money matters. Review financial matters, and position yourself for growth. In Gemini: Because Gemini rules communications, be prepared for miscommunications. Expect lots of phone calls or none, and lost or misplaced mail. You may not articulate clearly. At the same time, old friends may reconnect. In Cancer: Expect annoyances at home with baking, gardening, and household duties under domesticated Cancer. Complete repair projects that weren’t finished or done correctly. In Leo: Avoid speculative investments. It is not a good time to buy or sell or do any trading. Instead, analyze your investment portfolio. Use your know-how and advisory skills to help friends and associates. In Virgo: Challenging situations arise, especially in the workplace. Expect product delays and equipment breakdowns, as well as crankiness among coworkers under finicky, detailed Virgo. Double-check your work before you call it finished. In Libra: Accept your physical attributes; do not have a makeover. Indecision resigns, so limit purchases—or risk returning them. Libra, representing beauty, grace, charm, and diplomacy, is out of balance. Refresh, relax, and rejuvenate. In Scorpio: Emotions rule—not common sense—so beware. Avoid affairs of the heart. Passionate Scorpio is also secretive, and your secrets may seep out. Keep them in a diary. In Sagittarius: It is not a time to travel, so reschedule or just expect delays, lines, and lost directions. Instead, take care of local affairs. Patience and a sense of humor are needed. In Capricorn: Avoid buying, selling, or renting real estate under Capricorn, the sign that governs property matters. Expect problems with paperwork, packing, and movers. Reunite with family or vacation at home. In Aquarius: With Mercury retrograde in Aquarius, the sign that governs relationships, friendships are put at a risk. Petty squabbles, misunderstandings, and miscommunications abound. Know who your friends are. In Pisces: Foggy thinking, daydreams, and escapism are the norm; day-to-day realities confound otherwise clear heads when Mercury, the planet that rules logic, is in Pisces, which governs illusion. Practice creative pursuits—writing, dancing, photography, film, or painting. Previous Mercury Retrograde: Another chance to go within… or with it..? Pingback: The Oracle Report – Daily Energetic Analysis During the Time of Enlightenment, April 3, 2012 | 2012: What's the 'real' truth?